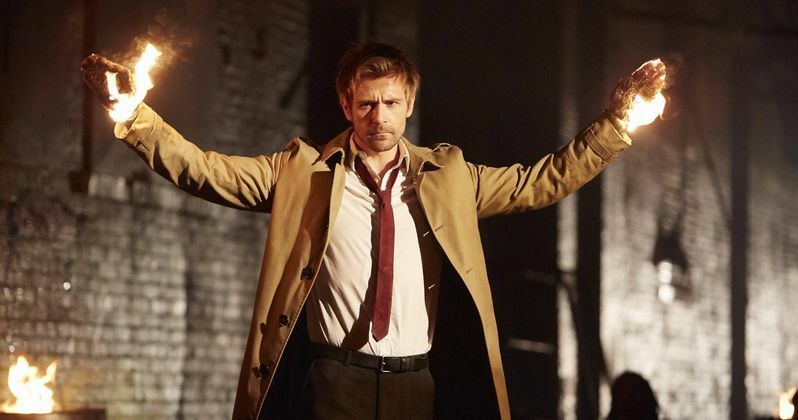 Back in November, NBC announced that production has stopped on Constantine, with the network deciding not to order any more episodes after its 13-episode order. The show does still remain in contention for a Season 2 renewal, but, with the show airing its season finale "Waiting for the Man" this week, many are wondering what the network's plans for the show are. A new report from Cinelinx reveals that the show, which has been struggling in the ratings but does have a passionate fan base, may continue on Syfy, where it will be rebranded as Hellblazer. Nothing is set in stone at this time, but this is something the netwrok is currently considering. NBC reportedly doesn't want to give up on the show quite yet, since, after the production stoppage was announced, a slew of #SaveConstantine messages popped up on various social networking platforms. The move to Syfy would give the rebranded show more freedom to explore "darker aspects of the comic book." Syfy did recently run a marathon of the series, where it did quite well on the network. Last week, NBC renewed five of their shows, The Blacklist (Season 3), Chicago Fire (Season 4), Chicago P.D. (Season 3), Law & Order: Special Victims Unit (Season 17) and Grimm (Season 5) for the 2015-2016 TV season, but Constantine was not announced for a renewal. It isn't known when NBC/Syfy may make an announcement about the future of Constantine yet, but we'll keep you posted as soon as more details surface.